Headaches (HA’s) in general make up one of the most common causes of human pain. If you have ever had a headache you know how debilitating they are, and how much they affect the quality of your life. However, not all headaches are created equal. In our December blog we are going to talk about the most common type of primary headache the TENSION HEADACHE, and what you can do if you are suffering with them. Tension headaches typically begin with pain in the back of the head and radiate to the top of the head. Described as “band-like” or “cap-like” pain. Many people describe the pain as a cap or band-like sensation, which encircles their skull. 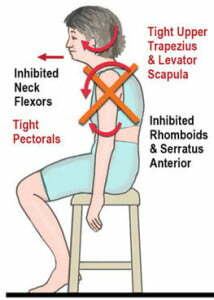 Others describe their pain as a muscle tension in their neck or shoulder region. Unlike migraine headaches, tension headaches are not associated with nausea or vomiting and do not have symptoms such as flashing lights or blind spots. Occur more commonly in women and according to the World Health Organization 1 in every 20 persons in the world suffer with a daily tension headache. The typical medical management of tension headaches involves the use of prescription or over-the-counter (OTC) pain medications. Other supportive treatments include stress management, ergonomic changes, and massage. It is important to remember that although OTC medications are used for tension HA’s that they are medications and may have side effects and potential interactions with prescription medications. It is important to consult a health care professional if you have questions regarding OTC medications and their use. At Behm Muscle & Joint Clinic we are able to use our conservative health care services and address the causes of your tension headaches. Our approach involves a full case history and functional evaluation of your range of motion, muscle imbalances, and posture. We are able to address your biomechanical issues by combining joint mobilizations of your neck and upper back, soft tissue therapy (Active Release Techniques, Myofascial Release, etc) to decrease tension in overactive muscles. Correct muscle imbalances in you posture (Upper Crossed Syndrome) by incorporating rehabilitation exercises to engage muscles that may have been weak by chronic poor posture/overuse. Research shows that Chiropractic joint mobilizations and soft tissue therapy are great treatment options for SUSTAINED Tension-Type headache relief. In the Boline et al study (1995) Chiropractic care was compared to the medication amitriptyline for tension headaches. During the treatment phase both Chiropractic care and medication care patients improved however 4 weeks after cessation of the study the medication group returned to pre-treatment status and the Chiropractic care patients showed continued improvement.